USB_CLASS_AUDIO compliant devices like standard USB DAC don’t need a special USB device driver. Instead, they use an operating system standard driver. The Android standard USB audio driver is the generic USB Audio Driver for ALSA (Advanced Linux Sound Architecture). And the latest Android 4.0 includes “card.c“, the USB Audio Driver for ALSA which should be compliant with USB audio class 2 devices allowing for 24 bits / 192 kHz. Android relies on Linux version 2.6 for core system services such as security, memory management, process management, network stack, and driver model. 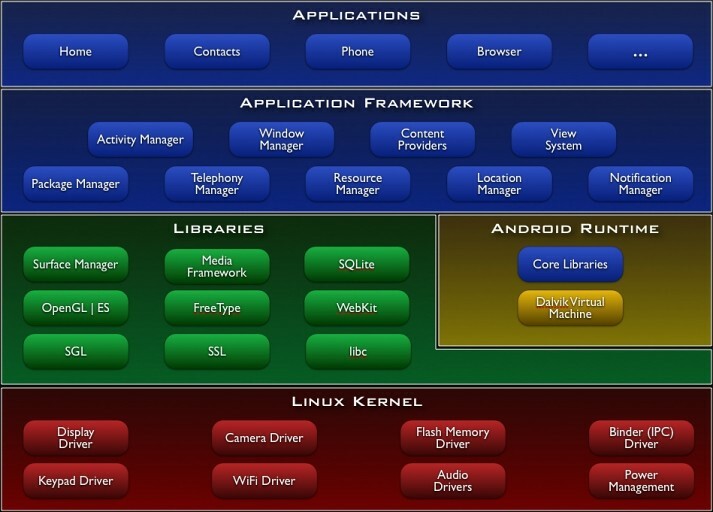 The Linux kernel also acts as an abstraction layer between the hardware and the rest of the software stack. Thus Android handles all the things that Linux is really good at such as a vast array of device drivers, which take the pain out of interfacing to peripheral hardware. Most USB DAC work without special USB device driver on PC, Mac and hopefully Android 4.0 devices with USB audio enabled.
. A storage module: Music is stored in file as a series of bits 0 & 1 with different encoding formats (MP3, WAV, FLAC…).
. A player: The player decodes the bits 0 & 1 to PCM digital audio signals.
. A DAC (Digital to Analog Converter): The DAC converts the PCM digital audio signals to the original analog audio signals.
. An amplifier: The amplifier amplifies the analog audio signals.
. A speaker: The speaker restitutes the music. Like a PC or a Mac, an Android phone is a digital audio system. Hopefully, the Android phone, running on a kernel with a USB audio driver, can output the PCM digital audio stream to an external standard USB DAC & amplifier & headphone, much more efficient than the internal DAC & amplifier & speakerphone. The USB audio request is currently ranked 50, and there are 17550 requests. In fact, it is ranked in top 10 of less than one year old requests.